Maybe you are new to the sport of running and have decided to conquer your first 5K. Or, perhaps you have run a fair share of 5K’s and want a further challenge by completing a half marathon (13.1 miles) or a full marathon (26.2 miles). Maybe you are running for a cause, to honor or memorialize a loved one. Whatever the reason for your motivation, it’s important to adhere to some basic guidelines to increase your fitness level while decreasing any chance of injury before the big day. Runners come in all shapes and sizes, as does footwear, which is why going to a specialty running store is invaluable. Fortunately, here in the Lehigh Valley, there are two top notch stores to choose from. Bruce Haines, owner of Aardvark Sports Shop says, “We fit the customer in a shoe that will promote a neutral position at toe-off as the foot should not be pronated or supinated at the end of the gait cycle. The runner’s foot structure is a good indicator of whether more or less support is needed thus minimizing the potential for injuries and discomfort while following your training plan.” Chris Schmidt, owner of The Finish Line Running Store recommends bringing in your old shoes when shopping for a new pair. 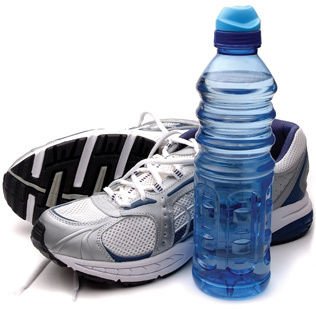 He says, “Your current running shoes are a great story teller of wear and possibly excessive wear. Our experienced, running staff will measure your feet and observe your stride running and/or walking.” Both agree that running shoes should be replaced every 400 to 450 miles. For additional information, visit The American Academy of Podiatric Sports Medicine, aapsm.org/runshoe. Running solo is fine, however, partnering with a friend or finding a running group or club can be supportive, motivating and fun. Runners World Editor-in-Chief David Willey is a big believer in group running and says, “Finding a running partner or group is not only fun, it also helps you ignore that voice in your head occasionally suggesting maybe you don’t feel like running today. If you know there’s a group waiting for you on a cold, dark morning, you’re more inclined to get out there. And, as any runner knows, afterwards you are always glad you ran.” You might even make a lifelong friend along the running trail. In terms of running as part of a fundraiser, Willey continues, “Running for a cause that is important to you is also a great way to get inspired and do some real good along the way. You feel like you’re doing something that’s bigger than just you, which is always empowering.” He suggests runners dedicate every mile of a race to someone who’s important to them. That’s motivation! Whether you are a newbie or a seasoned runner, no one starts out their race training by running the whole course. It’s important not to do too much too soon or you’ll risk getting injured. Veteran runner Ingrid Gerber of Allentown, who has run approximately 12 to 15 half marathons and 15 full marathons stresses the importance of joining a training group. She says, “The Lehigh Valley offers an abundance of running groups, whether you are training for your first 5K, half or full marathon.” She recommends a minimum 12-week training regimen, incorporating several shorter distance runs during the week, (not daily) and a longer run that will increase gradually on weekends. For most long distance races, registered participants receive weekly emails from the race director that includes an actual training regimen. For the past few years, Gerber led a pace group for the St. Luke’s Half Marathon, which keeps participants from running too fast early on and then tiring out quickly. She says, “Following a pace group allows you to enjoy your run without worry of keeping track of your time. Websites like lvrunningscene.com as well as runnersworld.com offer additional training tips, nutrition advice, running groups and events. “Listening to what your body tells you is the key to good health and fitness,” says Michael Price, Team Leader of Physical Therapy at Coordinated Health of Bethlehem. He continues, “If you are a beginner, having your physician’s approval is a good idea. Every runner should have proper footwear, stretch prior to and after the run as well as understand the importance of not overtraining, which can lead to injury.” Unfortunately, too many runners do not take the time to incorporate stretching into their run. Price recommends proper stretching to reduce muscle soreness as well the possibility of future injury and should be done 5 to 10 minutes both prior to and after a run. Heel and toe raises, step up exercises, dead lifts and side plank for hips are all beneficial stretches as well as cross training, which helps to strengthen the body. Price says, “Warm up stretching pre-conditions the muscles, while post-run stretching actually wrings out the lactic acid your muscles have built up so you are not as sore the following day.” If you do notice a symptom or pain of any kind, it’s important to take a break. If it continues, see your physician. He or she may refer you to a physical therapist, like Price, who will do a full evaluation, determine the problem and help you get back on your running feet again.